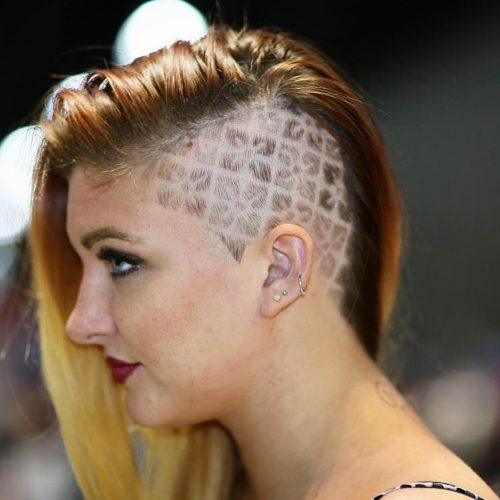 Own the element of surprise with one of these amazing hidden undercut designs for women. 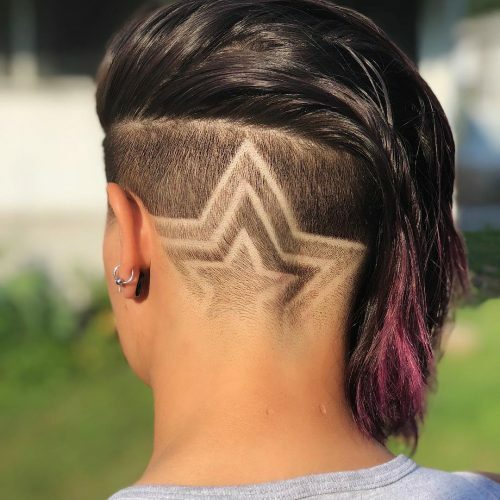 If you have a fierce personality plus a desire to expose your skin and your wild side, you better start consulting your hairdresser for ideas on how you can rock a hair tattoo. The expertise of your stylist is key to creating an intricate masterpiece that could wow everyone. This style allows for so much versatility! Any hair length and texture will do as long as you have the confidence to wear it. Tweak some lines and add in exquisite shapes for a more original finish. 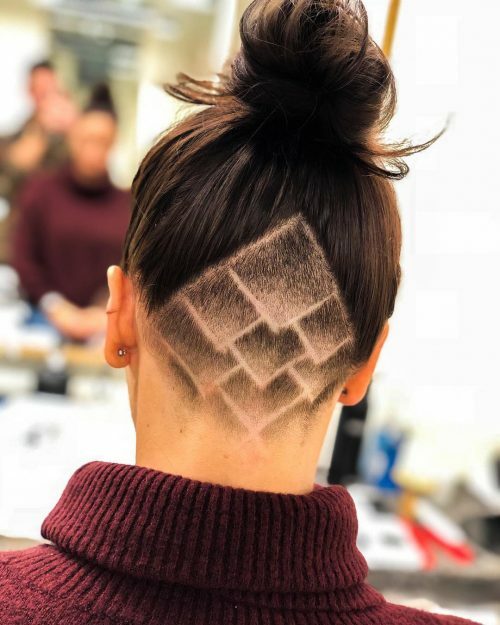 I’ve scoured Instagram for these insanely creative designs of shaved undercuts that will seriously give you major inspiration. 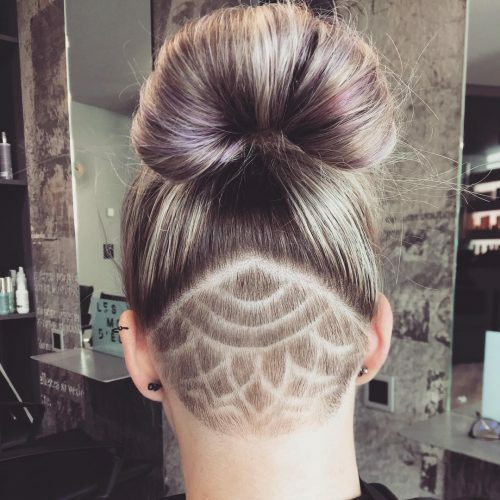 Get updated by exploring this collection of trendy undercut designs! It’s surely worth having a larger shaved area when you’ve got a gorgeous flower design like this. 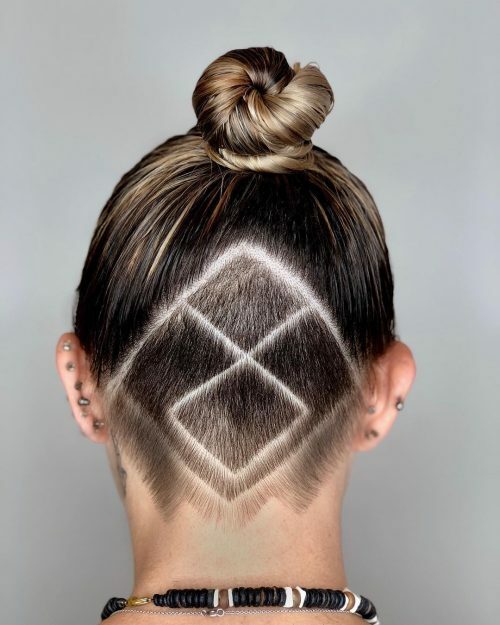 Stylist Tony created this fun and funky diamond undercut design. We love how much precision and creativity were put into this exquisite hair work! Rock your short candy pink hair by pairing it with a contrasting black geometric triangle pattern! This technique will totally give anyone an edge as long as you have the confidence to wear it. Get your hairstyle popping up like daisies with this pretty superb floral creation! This one’s a really unique and modern work that makes use of curved lines and different contrasts. It’s great if you want to have a neat and sharp look. The geometric pattern coupled with precise gradation in this shaved nape is the definition of classic art. It effortlessly gives off a sophisticated yet hip vibe. A simple and feminine touch to your nape makes all the difference. This lovely look is sure to get everyone’s attention! 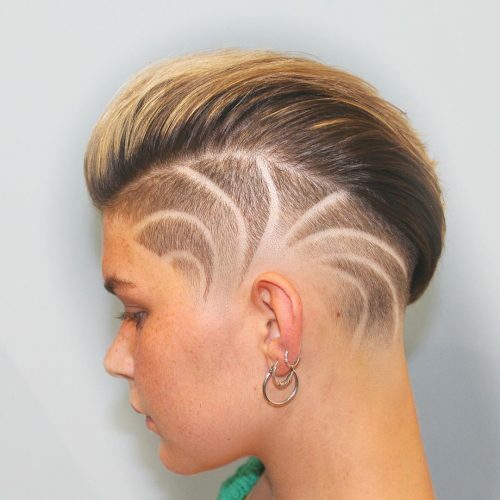 Create gradients by playing with different hair lengths in your undercut! This truly epic art would not be possible if not done by an expert stylist. 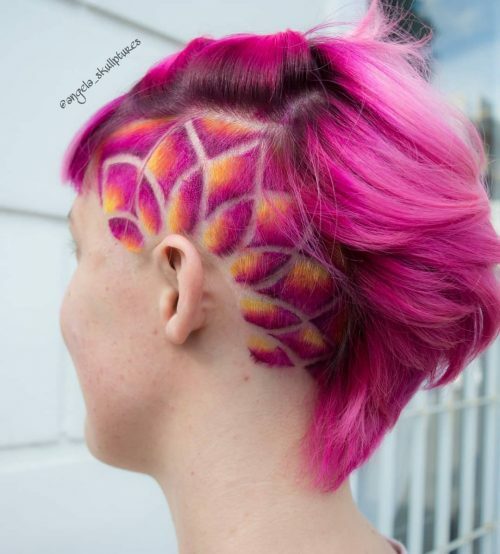 This features a wild orchid art that goes perfectly with a funky pink pixie cut! Notice the consistent short hair length that’s responsible for the stunning contrast this hairstyle has! Show your punk yet sweet personality with a pink and yellow floral artwork on a faded side. You can get creative with vivids as long as you’re up for the added upkeep they require. I like to call this one ‘Falling for Autumn’. What I love about this one the most is how organic it feels to me – like the leaf fell right out of her hair. I usually like to add a bit of color to make it stand out more but I thought it was perfect in her natural hair color. I love these cuts for people with very dense hair. It helps to reduce product use, shortens dry time, and adds flare to any ponytail or top knot. It’s also something fun to change up for any season, festival, or special occasion. I connected a classic hairstyle to the present with originality. The contrasting short and long in itself attracts attention plus the design enhances the look! 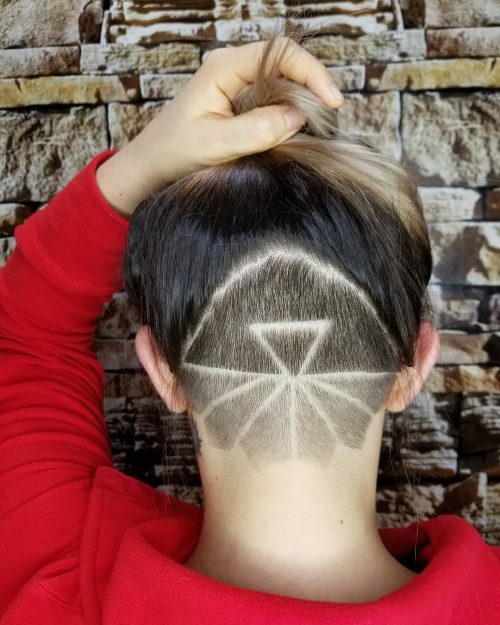 I executed the pattern on the shaved temple of only one side, and that made it unique. This hairstyle suits those girls who are not afraid to show originality. Such hairstyle is perfect for those working in places where there is no strict dress code. Thanks to the asymmetry of this hairstyle, the neck is visually extended, and its beautiful bend is emphasized. One more advantage of this hairstyle is that it is easily transformed: the shaved temple can be covered easily. You can look lovely in the afternoon and in the evening – the impudent hooligan. Although, the average duration of the undercut is from 2 to 3 weeks. After this time, hair grows and the design is lost. Maintenance will require a regular visit to the salon. 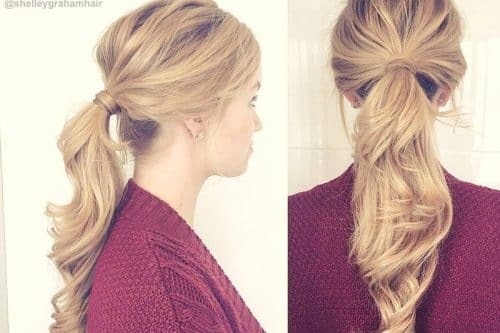 This hairstyle will draw the attention of people around. Also, be ready for people being curious, enthusiastic, and even envious! 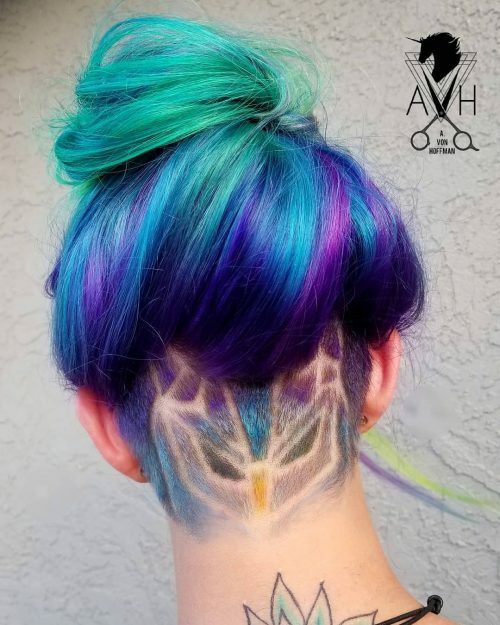 I call this particular undercut ‘Night Owl’. 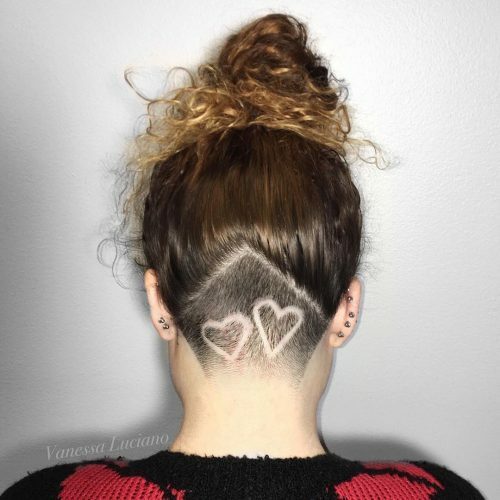 I love doing these free-form undercuts where the design lines create the shaved parting shape as opposed to seeing the traditional triangle or half head parting. Colored undercuts are also some of my favorite things to do. 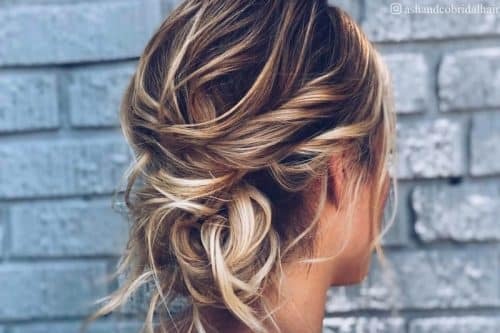 I love how it accentuates the design and keeps its shapes much longer as it grows out, and what a fun way to give your messy bun or pony some serious style! I think these styles are great for people with lots of hair, busy lifestyles, ponytail lovers, festival goers, tattoo enthusiasts with no commitment, top knot rockers and even fun for kids. It can be so liberating to only deal with half of that dense hair, 50% less dry and styling time, less product needed to tame the main, and endless styling possibilities. Undercut designs can be worn on the sides too if your looking to pack more punch with your next haircut. This is a perfect look for someone daring to bend the rules and not conform to societal norms. 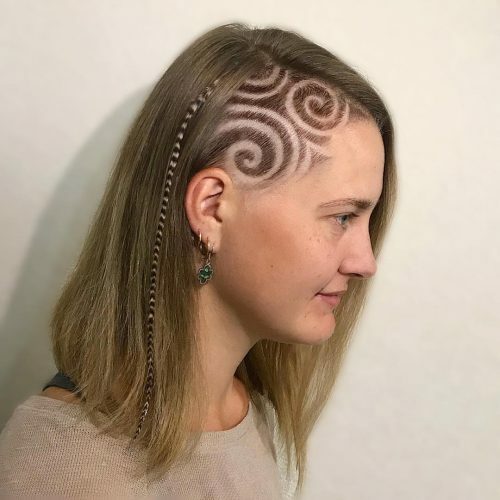 Not only does she have the buzzed side that sets herself apart from others, but the unique design is an added flare that can say a lot about her personality. Simplicity is key when it comes to my designs: I don’t want it to take away from the rest of the hair, I want it to enhance the overall look. 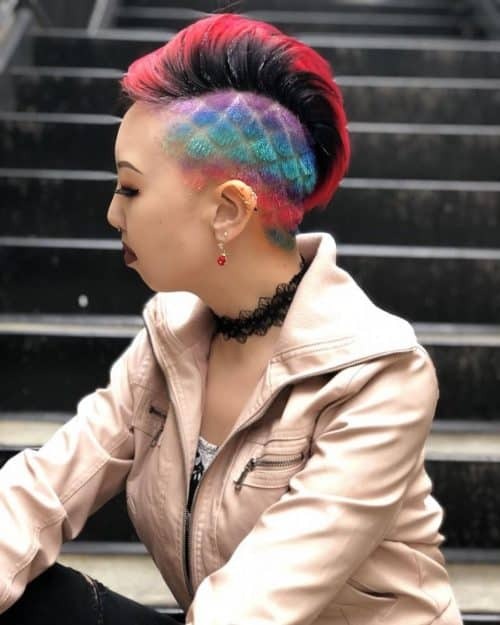 With the vibrant hair and undercut to match, everyone is going to notice. And that’s the best part about walking out of the salon after a successful service, you will feel like the most beautiful, badass person at that moment. This also a great look for someone who is a little bit edgy and loves bright colors. The coolest part is the vibrant red we chose since it nicely complements her skin tone and is super eye-catching. Undercuts can be placed in several places on the head in various sizes, like the nape or sides. 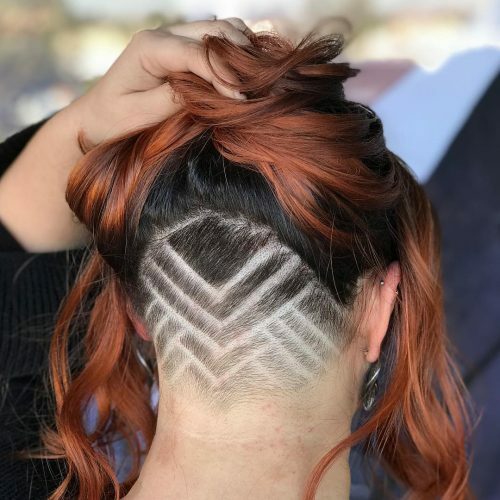 An undercut is going to be loud regardless of the location, so you have to keep that in mind before you go buzzing off a good deal of length. 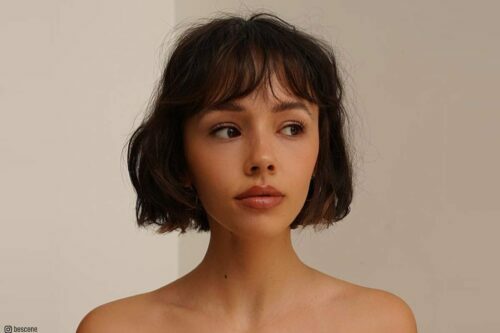 Sometimes it can be easily hidden by the rest of your hair if you want to switch up the look for a day or conceal it for professional settings, but it should be something that’s thought out plenty of time ahead, just as you would a tattoo. 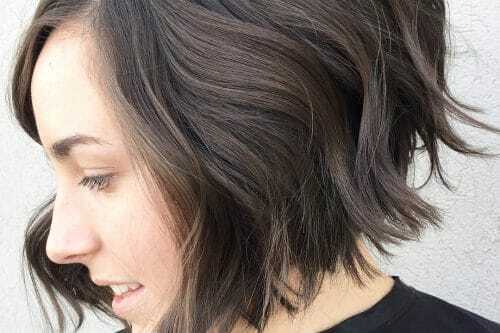 Hair typically grows only a half inch a month, so it’s going to take a long time to get to the original length of the rest of your head if you do decide to go through with an undercut. With that said, you’ll be seeing a barber or stylist more frequently to buzz it down to a nice manageable length before it gets shabby, typically every 4 weeks. It can be a lot of maintenance, but if you’re looking for an edge to your style, this is something everyone should experience in their lifetime. If someone is considering getting an undercut, they need to understand that it will be high maintenance! It will need to be buzzed and the design recut about every two weeks. 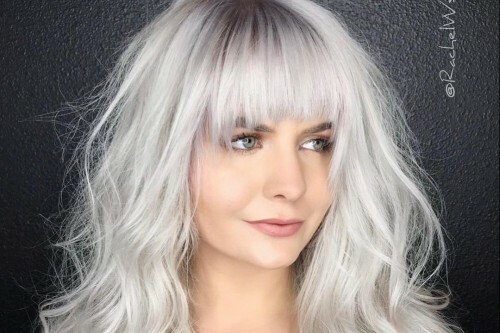 As for the color, a touchup every four to six weeks is necessary to keep the new growth from getting too long, and to keep the color vibrant. Since red is a large color molecule, it is the least stable and will fade more quickly than most other colors. So make sure to plan your follow-up appointment before you leave the salon! 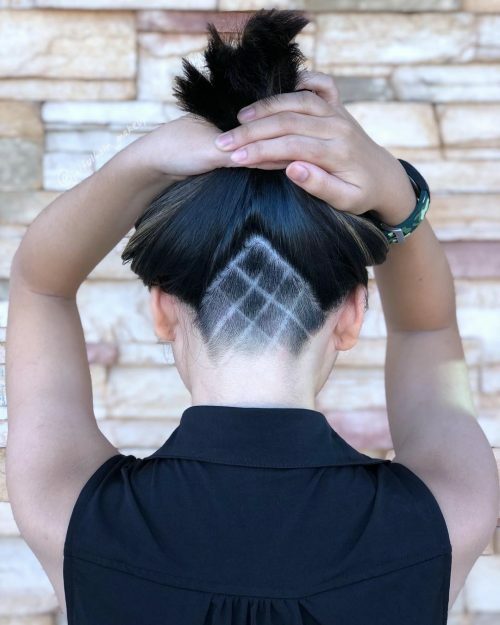 This undercut design look is edgy and fun. It’s straight lines but with a structured feel. It’s easy for me to do and feel confident with the outcome. I love the look because of its simple, yet stylish look. Clean cut and nice to look at. Consider the grow out. They’re fun, and you can change the design about every 3 weeks because it grows out so fast. One reason most clients choose to get an undercut is to reduce the amount of thickness to their hair. Once it’s shaved off underneath, it takes a lot of weight off the head. The second most popular reason is the design itself! The fact that it can be changed so often makes it appealing, I think. 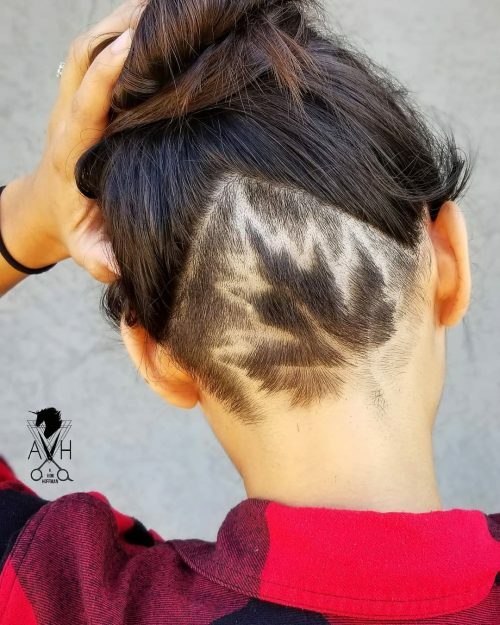 When clients wear their hair up, they can really show off their unique style with an undercut design. We call this look the Punkbré Mermaid: equal parts anarchy and glamour with maybe some glitter thrown in there. Our favorite thing about Catherine’s look is the 2-for-1 pattern, meshing the design of K.D.’s etched scales and the melting of Melissa’s ombréd lines of vibrant color. Though this may not make sense in theory, each design complements the other, quite like each of our skillsets. Anyone bold enough to try this fun, edgy look is probably already a rock star and not afraid to stand out and be seen! Lifestyle, maintenance, and product choice should all be considered when deciding if this look is for you. Undercuts grow out quickly and will typically need to be redone every three to four weeks. The upside to this is that you can change the design and the colors as often as you like, the possibilities really are endless! 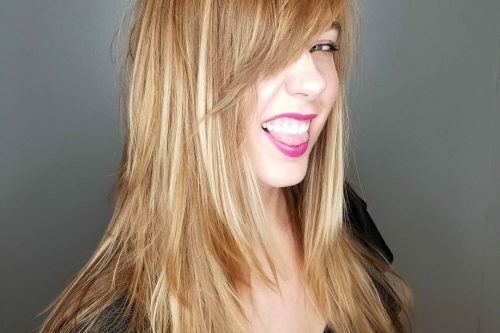 When styling this look, Melissa used Oribe Grandiose Mousse at the roots for amazing volume and Oribe Rough Luxury Molding Wax to give it texture and definition with a flexible hold. Everyone should take a hair risk every once in a while to try something different. It may change your entire life and leave you with something you love even more. 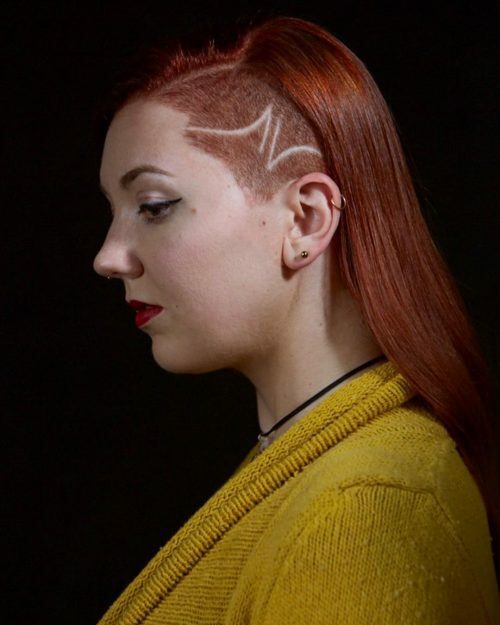 A couple clients who come to our salon have designed undercuts hidden by long hair. 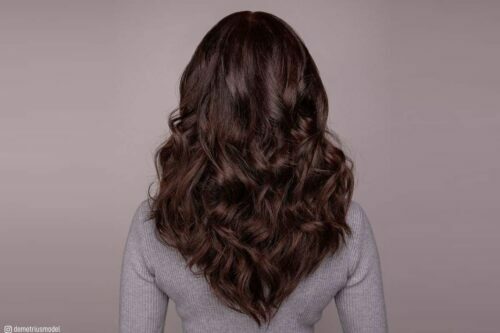 It can actually take an unnecessary amount of weight out for thick hair within the nape area so you can style it more easily and also have it covered for work if need be. Then, you can put up your hair and show off your wild side for a night out. So if you’re up for some fun, take a chance on us, Melissa Corley and K.D. O’Hair, at Salon Red of Brookhaven of Atlanta. We’ll be waiting! This look is edgy but feminine, and that’s always my goal with women’s undercut designs. You don’t have to be a boy to have some fun with clippers! I love the look of sharp lines but also some curves and angles. Adding fading for some dimension to complete the look. For color, we did a beautiful blend with her natural which is a popular trend, low maintenance, and so pretty! Love this look, so fun! Undercuts are so versatile and are one of my favorite hair trends right now! It’s the perfect way to make your hairstyle your own unique look. If you’re bored with your hair but not ready to get rid of length, undercuts are the way to go! You can be big and bold or small and subtle. 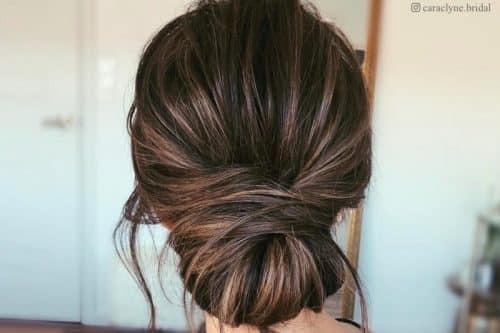 If you like to wear your hair up, what a way to show off your style or it can be your little secret and keep your hair down to lift for a fun surprise. Not to mention a great way to lose some extra hair for my ladies with thick hair! Also, it should save you on styling time and product use because there’s nothing there to mess with! It does require some maintenance if you want to keep up with the designs. But there are always great new designs to keep you looking fresh. It’s only hair, so express yourself! 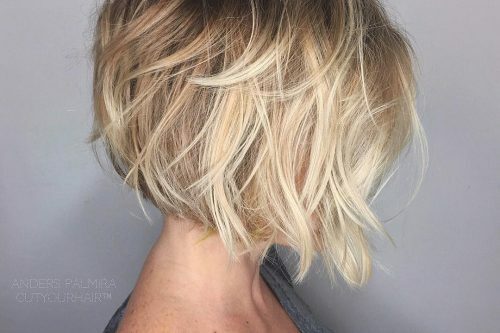 This cut is “secretly edgy.” I love this style because it’s really easy to wear. When you want to show off the undercut you just need to put your hair up in a bun or ponytail. For those clients who see this as a cut they could never “pull off”, you can ease their worry by showing them how easy it is to conceal. 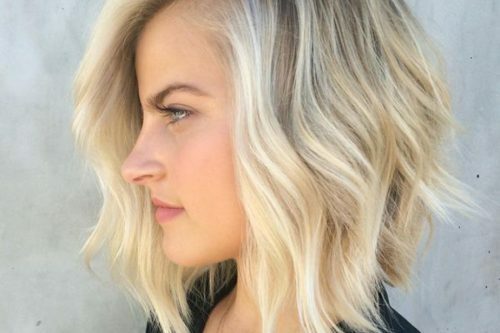 If you have been wanting this cut for forever but never had the guts, just do it. Life is too short for boring hair! If you want to keep the design intact though, you would need to cut your undercut every two weeks. 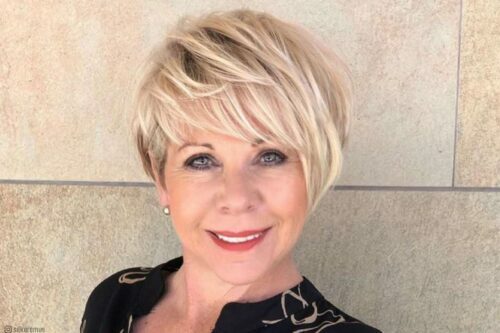 This cut is perfect for people with thick hair and wants to have a textured bob but their hair is too bulky, or for people who just to have fun! 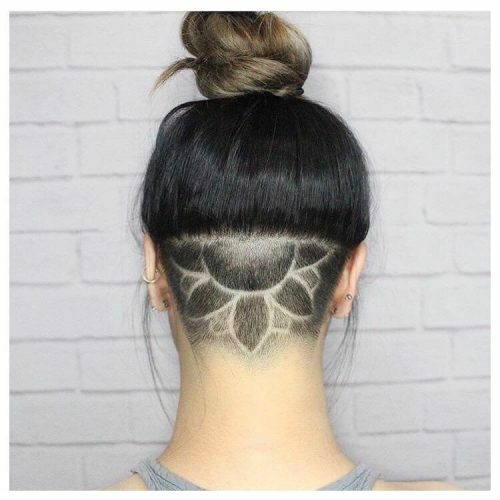 The look is a shaved side symmetrical flower design plus a long layered hair. The greatest part of this design is that you can either expose the design for a night out or cover it by letting the long layers fall over top of the design (in case you have to go to church or your mother-in-law’s). 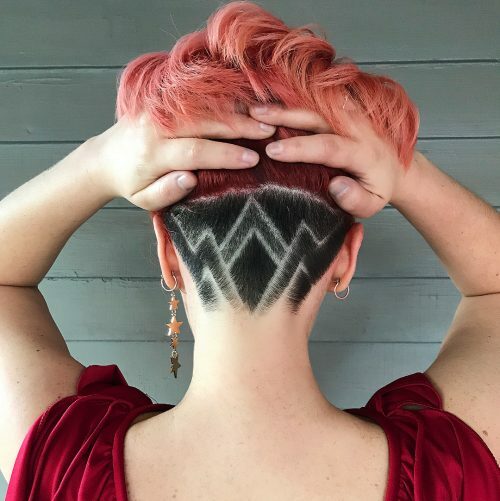 I also like the integration of a design on top of the shaved side, similar to tattoos it allows the individual to express themselves. Just try it! The best part about hair is that it continues to grow! When the design is fresh I recommend using a little bit of pomade/wax on the design to help add depth and contrast from the shorter/longer shaved lengths. The design will start to grow back in the first 2 weeks, so if it’s something you choose to keep you can continue to get different patterns to change it up. If you don’t want to continue on then you can cover the shaved side with your longer layers while the hair continues to grow. 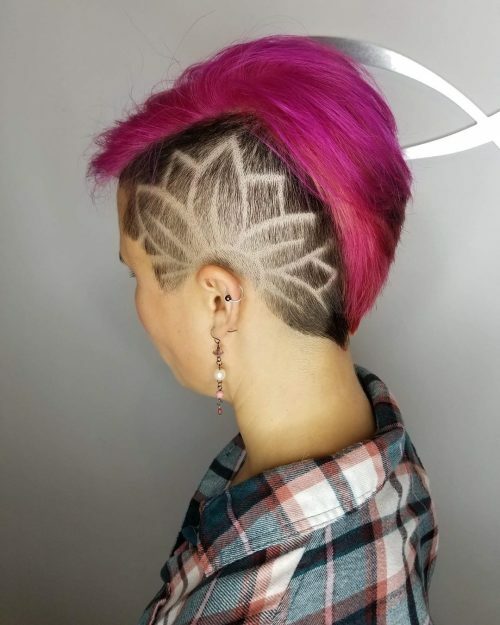 All in all, I really enjoy undercut designs and shaved sides with designs on female clients. I think it adds some edge and allows individuals to express themselves through their hair. For the stylist, it’s a great opportunity to have your artwork showcased on canvases that walk, talk, and can see all over the world.